This Friday night at the Route 66 Casino, the Legacy FC promotion will return to New Mexico for their second show in “The Land of Enchantment”. The fight card is full of New Mexico’s top talent but may be most notable for the first event that Fresquez Productions (co-)promotes without Holly Holm atop the billing. In her place, the show will be headlined by Los Lunes representative Cody “Freight Train” East fighting for the Legacy Title. While the title fight rings with more significance, a main card bout may actually be the most significant match-up on the night’s lineup as the fight has tremendous relevance towards the weight class and will propel the winning fighter to the next level of competition. On Friday night, Jordan Espinosa will make his way back from Ohio to take on Rafael “Barata” de Freitas in a Flyweight bout certain to entertain fight fans in attendance. Late last year, Jorge Hernandez and I sparked up some buzz when we posted our fantasy “Flyweight Grand Prix”. The article drew great numbers in terms of page views, sparked insightful conversation, and brought immense attention to each fighter discussed. It even led to an actual fight booking when a (former) local promoter who initially bashed the article, attempted to make the fight but failed to do so and the Legacy promotion came in and made the fight happen. Ray Borg and Nick Urso took to the cage for the first Legacy FC show in Albuquerque and after Borg came out victorious (shameless plug: I called it) he was signed to the UFC. In my discussion of the top flyweights in New Mexico, I included Espinosa as my dark horse in the category of top 125-ers with Borg, Urso and Joby Sanchez (who is also in the UFC). Jorge’s content included the addition of Barata in the place of Espinosa. Regardless, I think most if not all fans and analysts believe that Espinosa and Barata are among the most talented fighters in the state and two of the premier Flyweight fighters in our area. Espinosa (5-4) has a very deceiving professional record; the explosive Flyweight has several Bantamweight bouts on his record that prevent the true talent of Espinosa to show through numbers. 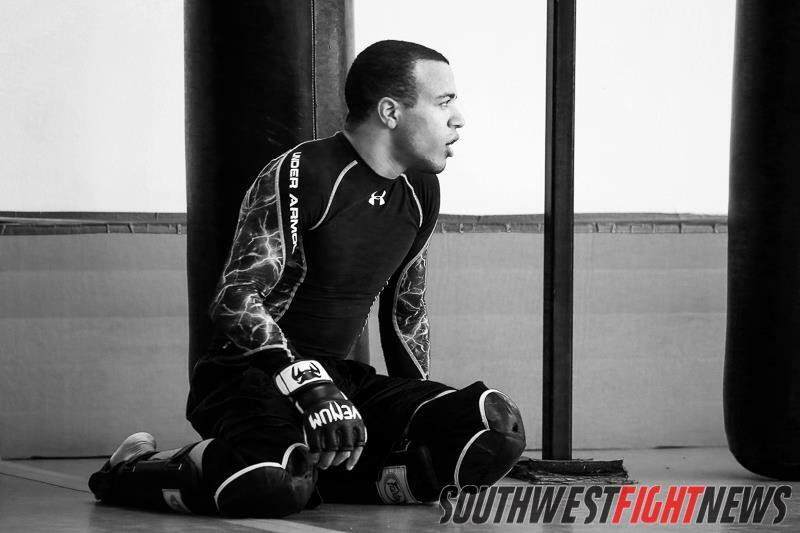 Training out of Ohio at the Demolition Fight Team, Espinosa has spent considerable time in Albuquerque training with some of the most well-known coaches in the area at the some of the premier MMA gyms as well. Returning to Lutrell’s MMA upon his return, Espinosa will definitely shake up the landscape of the Flyweight stable in New Mexico and can immediately make in impact in his Friday night bout with Barata. After an extensive amateur career that included stepping into the cage with fighters like Gene Perez, Joby Sanchez, and Ron White, Espinosa is already quite the successful fighter on our regional circuit. In Espinosa’s last outing in Albuquerque, he stopped FIT NHB’s Tim Sosa via submission at the XFC event held in September of 2013. The strengths of Espinosa are in his athletic abilities. Being tremendously quick and explosive make Espinosa’s striking very difficult to defend and his wrestling background makes him dangerous anywhere in the cage. While Espinosa has yet to finish a professional bout via strikes, he has a pop to his jabs that send opponent’s heads snapping back and is very proficient with lead strikes. In his previous bouts, Espinosa has used his wrestling to dictate the pace of the fights and when he feels an opening on the mats, he secures fight ending submissions with front chokes like the Brabo being “go-to” moves for Espinosa. Rafael de Freitas (6-0-1) hasn’t seen action in the professional ranks since his draw with Antonio Banuelos since March of 2013 but did compete in “The Ultimate Fighter” in September of the same year for the season’s eighteenth show coaches by Ronda Rousey and Meisha Tate. Barata’s undefeated record is also misleading similar to Espinosa’s except in the literal sense in that when Barata fought for the UFC’s reality show he was stopped via strikes in the initial fights to get into the TUF house but the fight is considered an exhibition and does not list on a fighter’s official record. Training out of the Chavez Dojo/Gracie Barra NM and spending time at the Jackson-Wink gym, Barata is a World Champion Jiu Jitsu practitioner who comes into the fight with notoriety from all-around the world. Inventor of the “Barataplata” and a renowned Black Belt, Barata is one of New Mexico’s best grapplers and a very dangerous tactician once the fight hits the mats. With his dangerous grappling skills noted, Barata is also a very good striker who relies on speed and very flashy striking to overwhelm opponents. 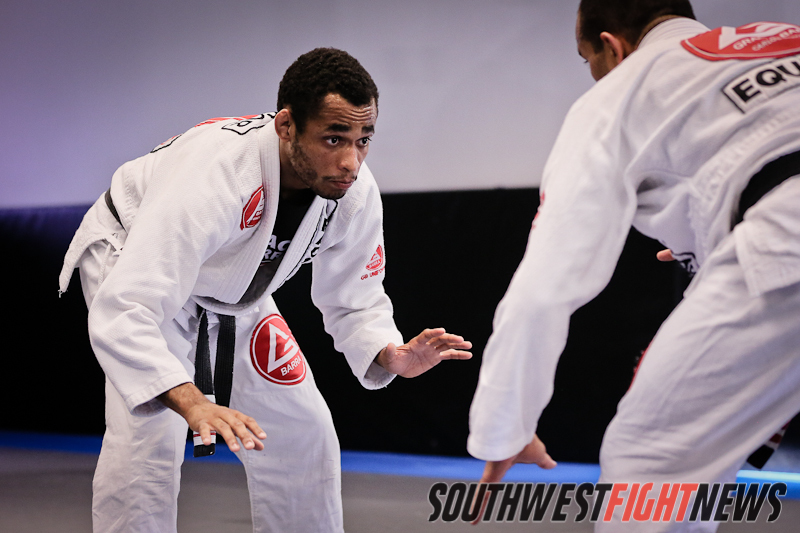 A kick heavy arsenal is the driving force behind Barata’s fast pace offensive and his JIu Jitsu talents allow Barata to feel comfortable throwing any strike in the cage knowing that if he is taken down, he is a wizard on the mat. Two of the quickest fights will step into the cage on Friday night and what fight fans may see are two blurs all over the cage looking to best the other in a stylistic match-up that may be all too perfect. Barata is comfortable fighting off his back where his guard is solid and his sweeps are excellent, Espinosa’s wrestling allows him to feel most comfortable in top position where his ground and pound sets up guard passing and openings for submissions. Both Espinosa and Barata are agile on the feet where they both also favor the inside leg kick to set up whatever they plan to attack with next where it may be a high kick for Barata or a single leg takedown for Espinosa. I believe the fight will be decided in the first round as Espinosa can be a quick starter. For those who have seen the fight between Barata and fellow local Joshua Montoya, the blueprint to this fight can be told in that 2011 bout. If Barata has cleaned up the areas for improvement since that time, he can capitalize on the openings Espinosa could leave on takedowns or draw him into a kickboxing bout that if Barata is more defensive minded could win on points through his speed and array of eccentric strikes. For Espinosa, his efficiency in lead strikes can make a huge difference as his speed and power can make Barata pay for a very relaxed defensive guard. If the fight hits the ground and Espinosa avoids wrist control and remains poised against the Jiu Jitsu Ace, Barata hasn’t shown his high level Jiu Jitsu transitions to MMA against higher level competition. Barata has strayed from fighting marginally larger fighters and has struggled against such fighters like Cody Bollinger in TUF and a re-match with Montoya (Barata won via split decision). Cancelled bouts between Dustin Ortiz and Josh Sampo would have helped feel where Barata’s MMA game is in 2014 but being out of action for 13-months may play a factor in the bout. Espinosa is the more active fighter but that doesn’t necessarily indicate an advantage, as any fighter can burn out with a busy schedule. Aside from four MMA bouts this year, Espinosa has a boxing bout under his 2014 belt as well. If a weakness is apparent for Espinosa it is that he has multiple submission losses on his record with two of those coming via rear-naked choke. If Espinosa makes a mistake and allows Barata to get back control it could be a disaster as the Jiu Jitsu wizard is definitely tough to shake. For Barata, he normally enjoys a speed advantage and Espinosa can play the point game where he gets off his strikes first making for a frustrating outing inside the cage for Barata. Fight fans we are in for a treat. No matter how you spin it, whether my assessment is completely wrong or spot-on, Espinosa vs. Barata is guaranteed to excite and certainly will give one fighter a huge push in their career. A win for Barata keeps his undefeated record intact and prepares him for possibly another marquee fight that could get him the needed victory to join New Mexican Flyweights Ray Borg, Joby Sanchez, and John Dodson in the UFC. For Espinosa the stakes couldn’t be more valuable as a win over Barata gives him a marquee victory over a notable named fighter and preps him for much more significant bouts down the road. Legacy FC 36 takes place this Friday, October 17th at the Route 66 Casino just outside of Albuquerque. The doors open at 6:00 pm, fights start promptly at 7:00 pm. You can purchase tickets from your favorite fighter, from rt66casino.com, Cage Tix (https://www.cagetix.com/legacy) or call 505-884-7484. What Would A UFC Event Look Like In Albuquerque? With A Looming Date With UFC Champion Rousey On The Horizon, Who Will Holm Pair Up With In Her UFC Debut? Phillip Lujan is one of the lead contributors and a featured writer for SWFight.com. Specializing in MMA breakdowns and analysis, Phillip is considered the MMA aficionado on staff. With nearly ten years of experience in combat sports, gazing through the eyes perceptively as a fan and a cornerman and from fight manager to analyst. He can be reached on twitter at @KingStark24 or through email at marcello.lujan@gmail.com.